Airg is another community site where you can meet other people, share your ideas and play with their fun games. You can access Airg Chat and Airg Big Barn World using your computer or PC by just following simple steps provided below. Meeting other people in Airg community through Airg Chat is effortless as almost everyone of us has it's own mobile. You can directly communicate to your friends and love one's by just messaging them on their profile and catching them in chat rooms with flirting nice Airg VIP Chat Emoticons. Playing games with others is fun. 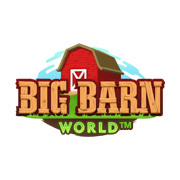 Airg's Big Barn World is the latest social farming game where your can play with your friends and achieve your strategy to boom your farm. 1. By just typing the URL http://www.airg.com/games then your good to go! 1. Download the latest version of Firefox browser on your PC. 2. Install XHTML Mobile Profile for Firefox. 3. Then install also Quick Preference Button menu for Firefox. 4. Restart your Firefox browser. 5. Click on Prefs>Spoof>Pretend to be, just select mobile UA you want to pretend with your Firefox browser. 6. By just typing http://airg.com your know good to go! You may also read this post about Airg Chat VIP Themes and Airg VIP Chat Emoticons.